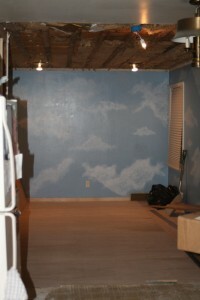 November 25, 2008 in Flooring, Kitchen, Lighting, Renovation | Be the first to comment! 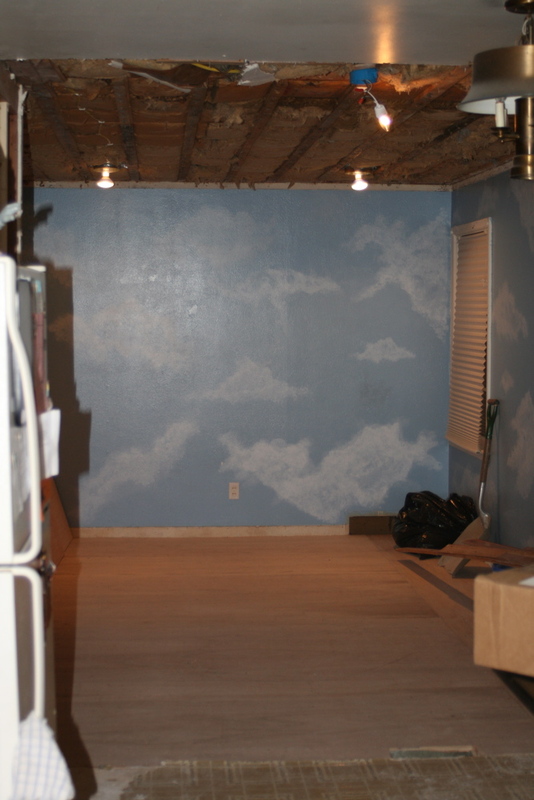 Progress today: the subfloor was laid in the cloud room to make it even with the eighty layers of subfloors and vinyl that currently exist in the kitchen. A temp light was placed where the pendant light will be, and two cans were placed for recessed lighting. I purchased the chrome table Sunday night, and while it will be a few weeks before the custom-made table arrives, the chairs and table legs are already on their way. So I’ll place the chairs in a rectangular shape and just pretend for awhile, okay? Current dilemma: flooring. Yes, I’m still stuck on it. Since we’ve decided to go with a laminate (“floating floor”) after being rather horrified at the stacks of vinyl currently making up our kitchen floor, I’ve since been torn between what look I want. Wood is out, but tile looks are verrrrry limited in the “dark” category. My husband is pulling for the good old classic black and white checkerboard. I’m still on the fence, which by this time is coming close to being my permanent home. The good thing about laminate is this: if I do hate it to the point of feeling nauseous every time I see it, then it’s easily removed and replaced with something I actually do like. Of course, FINDING that floor that I “actually do like” may take another fifty years. By that time, the eighties look will be back in, which means that we remodeled for nothing. Next dilemma: wall colors. Paint with color? Paint white and try to find a retro border?